Drawing has always been a struggle for me and the older I get the harder it gets. My eyes no longer focus as well as they did (my right eye has never focused as it’s lazy LOL) and if I concentrate too much, I get a headache. 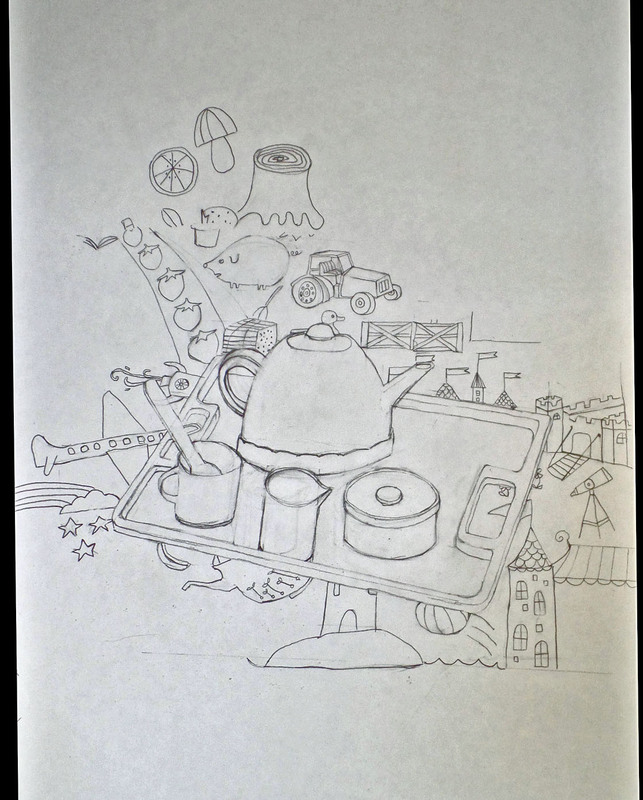 This was the first drawing of doing this setup which was piece of fabric from Ikea and part of my grand daughters tea set. Originally I was going to paint it but looking at the complexity of the fabric design I decided to draw it first. My other motivation being the fact I have a stack of drawing paper from when I first arrived in the US. I ordered a 100 sheets 36″ x 24″ but ended up getting 3 reams instead by mistake. Contacted the seller and they said keep it as it too expensive to return. I was only charged for the 100 sheets so it was a bonus for me or so I thought. I still have about 2.5 reams left! So this is my second drawing as I was not happy with the first drawing as the angles seemed wrong. Well I never did manage to get them right as you can see from the drawing below. The table I was using was well below my eye level so I was looking down on the set up. Ignoring the maxim of never erasing your drawing marks, I continued to make the same mistakes time after time. Surprising even though I studied at Camberwell for nearly 3 yrs (foundation and Saturday morning classes) I never learnt how to use a plumb line, pencil or whatever to gauge proportion or angles. I am trying to teach myself that now, carefully drawing a mark for where my foot is position whilst I draw and trying to remember not to move my head too much. I am pretty sure I will not continue to do that but it might give me more of an idea how to assess these things instead of blindly blundering into the subject as per my normal method. So I have spent the past week drawing this whilst reading numerous books about drawing. Hasn’t helped! Eventually I would love to have the freedom to use the drawings as basis for painting so I am not restricted to setting up a still life. I have a long way to go. 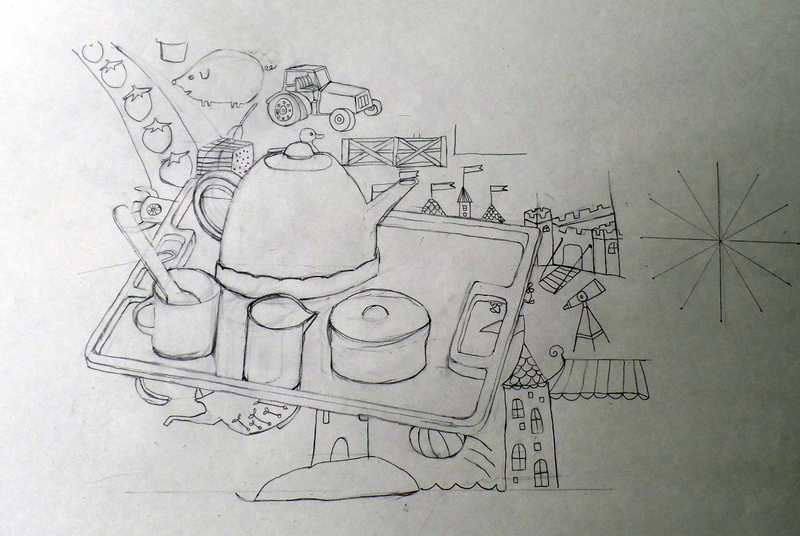 So its back to the drawing board again but this time I also plan to paint the still life. Once the cooler weather comes in the Fall, I will go out and draw from life but at the moment with temperature in the 100f/38c plus range, I will contend myself with still life set ups and looking at objects around the house. 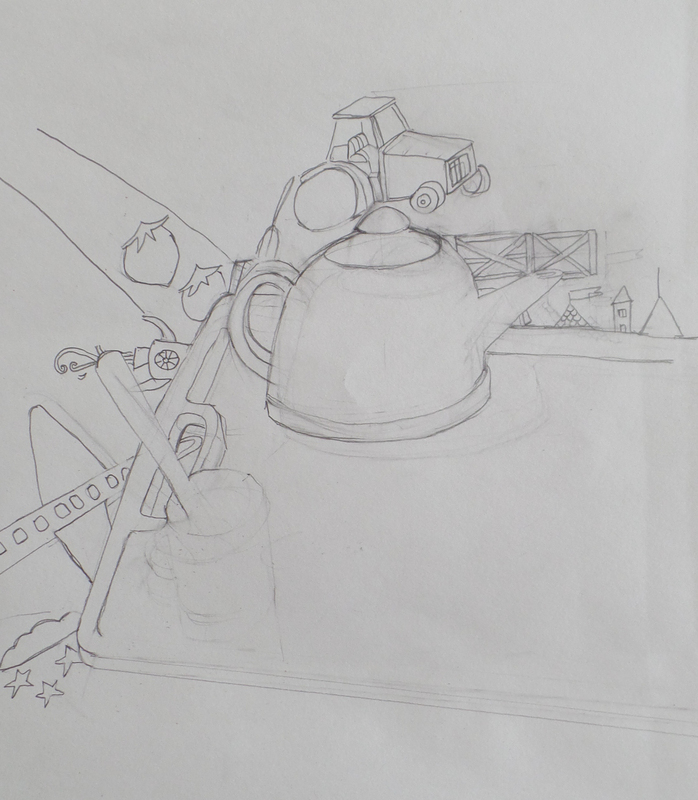 This entry was posted in drawing, still life and tagged Camberwell school of art, drawing, still life. Bookmark the permalink.